On July 21, the view from the shores of Poughkeepsie gets even more spectacular with the return of the Dutchess Dragon Boat Race & Festival, now in its fifth year. 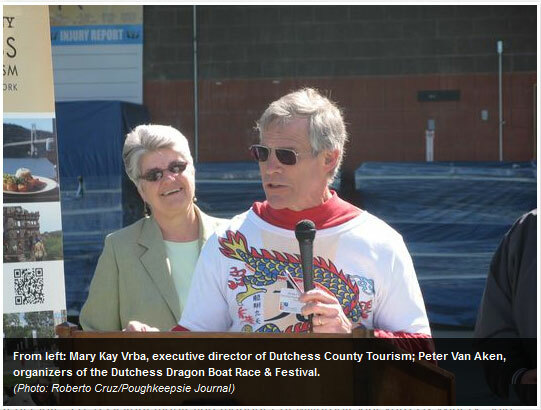 The dragons return to the Poughkeepsie waterfront for the second year during the Dutchess Dragon Boat Race and Festival July 25. Clans of dedicated participants undergo a week of training in order to prepare for the Dutchess Dragon Boat Race and Festival. Ten teams made up of 16 paddlers, one drummer, and a professional, experienced steerer, will compete for glory on the Hudson River. Spectators will have the opportunity to visit the day-long Asian Cultural Festival which will include games, dancing, souvenirs, and food and drink . . . [read the article]. All sorts of wildlife inhabits the Hudson River, but dragons will dominate the waters this weekend. Representations of the mythical beasts will take to the Poughkeepsie waterfront Saturday for the second annual Dutchess Dragon Boat Race and Festival. A tribute to traditions from Chinese and other Asian cultures, the festival will feature wood-block printing, paper art and traditional Chinese foods. Sixteen boats, each decorated with a dragon head and tail will compete in a 200-meter race . . . [read the article]. 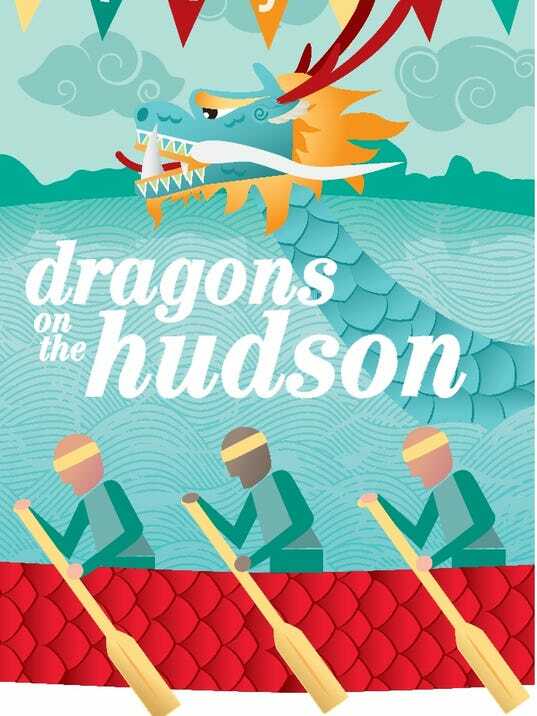 The dragons are coming back to Poughkeepsie on Saturday, July 25 for the 2nd Annual Dutchess Dragon Boat Race and Festival. Featuring Dragon Boat Races on the water and the Asian Festival on shore, the event will provide a full day of fun. The dragons are returning to the Poughkeepsie waterfront on July 25 for the second year during the Dutchess Dragon Boat Race and Festival. Dragon Boat Races are a Chinese tradition that has gained popularity across many Asian cultures. The races begin with a ceremony at 9 a.m. that awakens the dragon. Locals saw an unusual sight on the Poughkeepsie waterfront Saturday: dragons racing in the Hudson River. Considering the way that the opening of the Hudson River Rowing Association Community Boathouse on the Poughkeepsie waterfront has pumped up local interest in human-powered competitive boating, converging with the fact that Arts Mid-Hudson’s Folk Arts program has been sponsoring an annual Asian Festival at Waryas Park for years now, it seems inevitable that said waterfront would eventually become a host site for the ancient sport of dragon boat racing . . . [read the article]. Team Awaken the Dragon, sponsored by Peter Van Aken, gets last-minute instructions from coach Greg Chang before paddling out to the starting line . . . [see the article]. PHOTOS, VIDEO: Dragon boats roar down the Hudson. Chinese dances and music, legends of dragons, food trucks and boats melded to create a dynamic new festival on the Poughkeepsie waterfront . . . [read the article]. 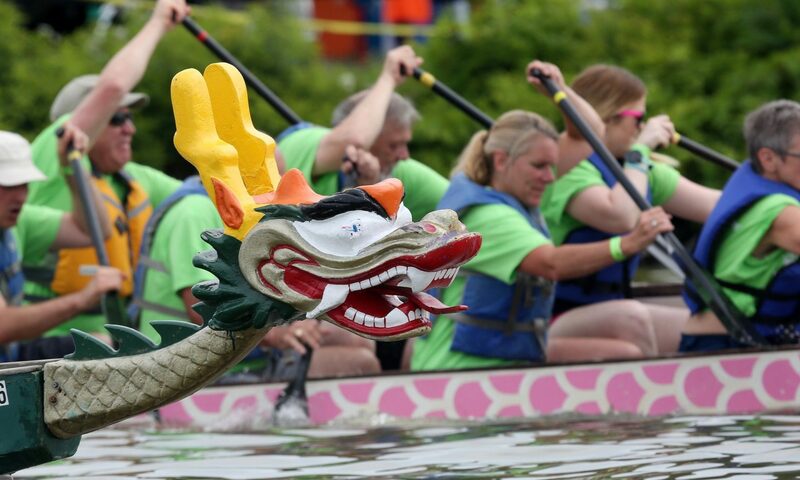 Dutchess Dragon Boat Race and Festival Held in Poughkeepsie.